FFFFOUND Desktop is an Adobe AIR application that brings the joy of FFFFOUND to your desktop through an original interface. I made this app on my own and am not affiliated with FFFFOUND in any way. I am using FFFFOUND's name and logo with Keita Kitamura's permission. For more legal stuff, here's what FFFFOUND says. Your username/email and password are not stored anywhere if you don't check "Remember me", I swear. If you do they're stored in the EncryptedLocalStore. At this time, animated GIFs are rendered as static images. Your screen has to be at least 800 pixels high in order to view the entire app. Some utility classes used in this project are available. 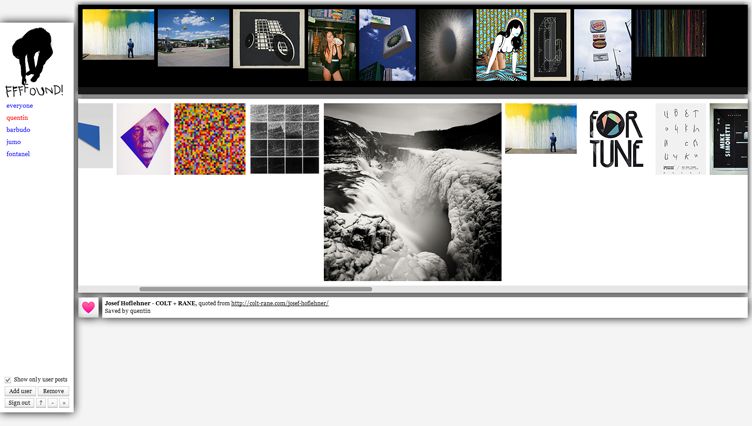 The FFFFOUND API itself is open source! Read more here. Drop a comment on FFFFOUND Desktop's blog post!